Many parents are familiar with not only the challenge of getting to church on Sunday, but with the challenge of keeping restless little ones still, or of enduring the impatience of teenagers longing to get on with the rest of their day. 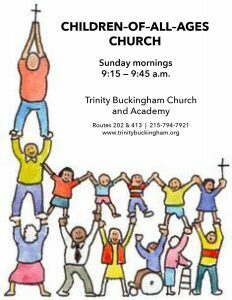 In answer to these challenges, Trinity Buckingham Church is offering Children of All Ages Church, a relaxed and casual shorter service held on Sunday mornings from 9:15 to 9:45 a.m. The Children of All Ages service liturgy is particularly oriented toward young people, but is designed for participation by both children and adults alike. (Some adults without children come on their own)! It includes a shorter gospel reading, a favorite song of the week, a short homily message and Communion around the altar with homemade bread. Trinity Buckingham Church is located at 2631 Durham Road in Buckingham, PA, at the intersection of Routes 202 and 413. There is ample parking behind the church.